• Measured by surface plasmon resonance recombinant human VEGF-C binds to immobilised VEGF-R2 receptor Fc with an apparent KD of 1.1nM which agrees well with the figure obtained by Joukov et.al. using porcine aortic endothelial (PAE) cells expressing the full-length VEGF-R2 receptor (0.41 nM). • The corresponding KD for VEGF-C dimer binding to VEGF-R3 Fc was 9.43 pM, a > 10-fold increase in affinity to the value obtained by Joukov et.al. 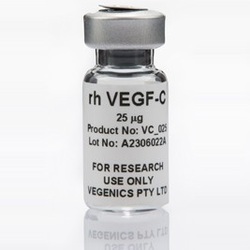 who used the cell-surface form of VEGF-R3 (0.135 nM).